How it serves our nervous system and birth experience. We have all seen the disempowering scenes of a woman giving birth in a movie or on television. Often times the birthing mother looks terribly uncomfortable, she is screaming at her spouse who is utterly useless. Hospital staff is yelling and running about while machines are beeping and general chaos seems to swirl around the room. It is no wonder so many women have feelings of discomfort around the idea of giving birth; all our subconscious is fed is negative images. Birth can be a calm and beautiful event that a couple experiences as an empowered team, consciously brining their child into the world. Having the perfect birth you dream of is as easy as understanding how your nervous system operates and practicing how to work with it while in labor. Our nervous system is the great controller of our overall state of wellbeing. We have two states that our nervous system takes on, parasympathetic (when you are relaxed in a comfortable environment) and sympathetic (your fight, flight or freeze state which is triggered by anxiety or fear). When we are in a parasympathetic state all body functions act normally and perfectly; our heart beats at a comfortable pace, our food is digested and we feel secure. When we are in the sympathetic state our body prepares to fight or run. All of our adrenalin is directed to the heart. The heart starts to race and send blood to our arms and legs so that we can flee. When blood is directed to our hearts arms and legs it is taken from the uterus, placenta and baby. If hooked up to a fetal monitor the babe would start to show signs of distress, causing further anxiety to the birthing mother and the cycle of medical intervention begins. This scenario of mother and fetal distress in birth can be EASILY side stepped if the birthing mother can keep herself in a parasympathetic state of empowerment and calm. Doing this is simple with proper training in breathing techniques and understanding that fear needs to be completely out of the birthing mothers mindset. In Hypnobirthing we spend a great deal of time dehypnotizing couples from all of the messages and ideas they have been given about birth. We dispel fear with knowledge of how our birthing bodies actually work and equip couples with practical relaxation techniques. A large part of the curriculum is geared towards giving tools to fathers and partners so they can be active participants in the experience. 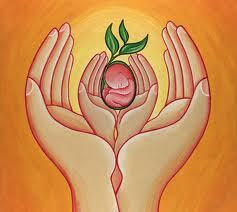 Natural childbirth is a powerful life changing experience. Our bodies are perfectly designed and if allowed to operate naturally our hormones beautifully carry us through each stage labor no matter how long or short our birth may be. Natural childbirth takes preparation, focus and work but the rewards are well worth the time. Getting to feel your baby move through you, working with you to come down and out of your body is beyond words. When in active labor we act as a bridge between heaven and earth, filling the birthing room with oxytoxin, inspiring and uplifting everyone who witnesses us. You deserve to feel that internal power and it is your birthright to birth on your own terms without regret. Sign up for a class today and get the tools you have been looking for. Your beautiful birth awaits you!